Now imagine a new, sparkling, symbol of our great Nation plying the North Atlantic carrying our flag to the European ports of call. She carried my grandmother and grandfather and me to visit relatives in England. I can still see my them dancing in the ballroom. 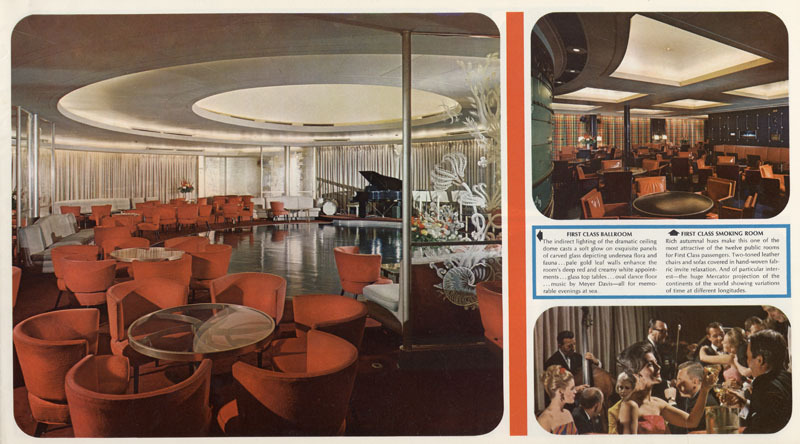 The First Class Ballroom aboard the SS United States. 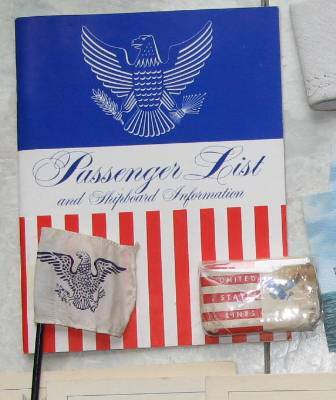 The SS United States was the very best of our Nation, a unique symbol of our United Country. Our red, white and blue carried over the waves. This great liner represents our United, Strong, Benevolent Nation and this is the reason this important part of our history needs to be preserved. 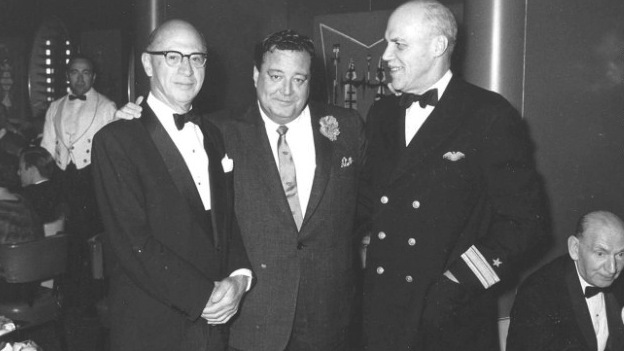 Jackie Gleason aboard the SS United States with the ships’ officers. Gleason was an American comedian, actor and musician. He was known for his brash visual and verbal comedy style, exemplified by his character Ralph Kramden in The Honeymooners. Among his notable film roles were Minnesota Fats in the 1961 drama The Hustler (starring Paul Newman) and Buford T. Justice in the Smokey and the Bandit series. 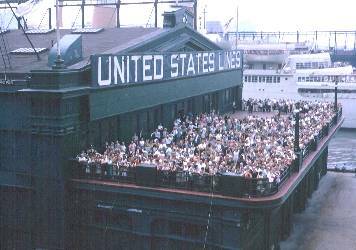 A video worth watching of the SS United States. Susan L. Gibbs, wearing a sleeveless blue dress and sandals, holds a small flashlight as she descends into the interior of the crumbling transatlantic ocean liner. A resident of Northwest Washington, she once got lost wandering this ship. “It was so strange,” she says. “You can get disoriented.” Farther into the gloom they descend, from C Deck to D Deck, then through a huge door like that of a giant refrigerator. “It’s over here,” she says — indicating a floor-to-ceiling metal box in the corner. 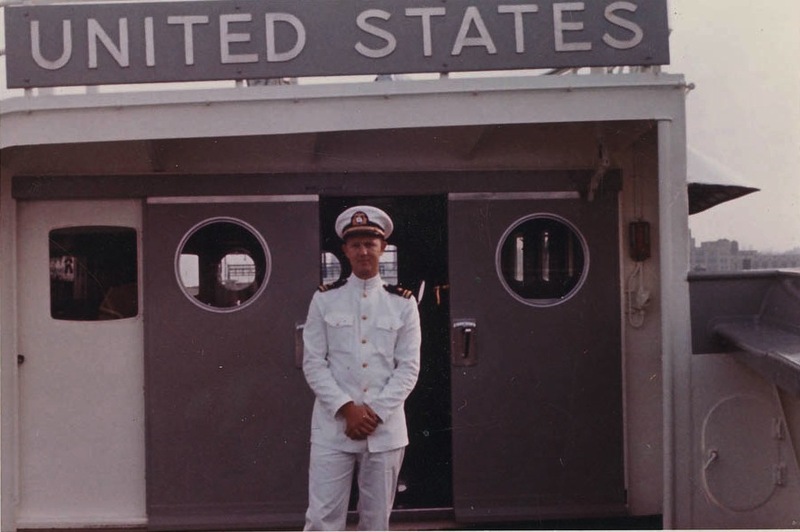 SS United States – a ship’s officer standing outside the wheelhouse. 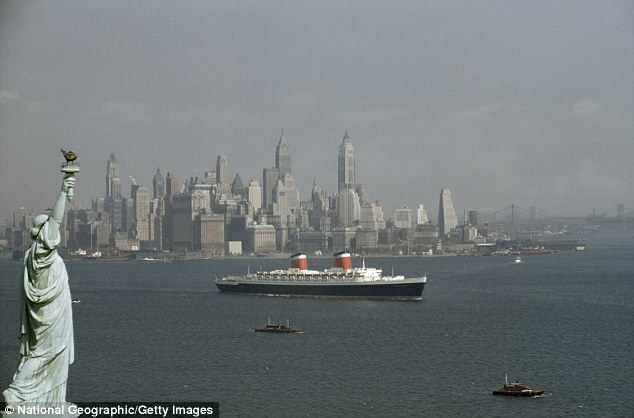 The SS United States once made the nation proud as the fastest ocean liner in the world. Decommissioned in 1969, it has since been deteriorating at a dock in Philadelphia. Now Susan Gibbs, granddaughter of the ship’s designer, William Francis Gibbs, is fighting to give the ship new life. Of all the places on the rusting behemoth that Gibbs, 52, is trying to save from the scrap yard, the morgue may be the most pristine. William Francis Gibbs, and launched in 1951, is a landscape of peeling paint, cobwebs and vanished grandeur. 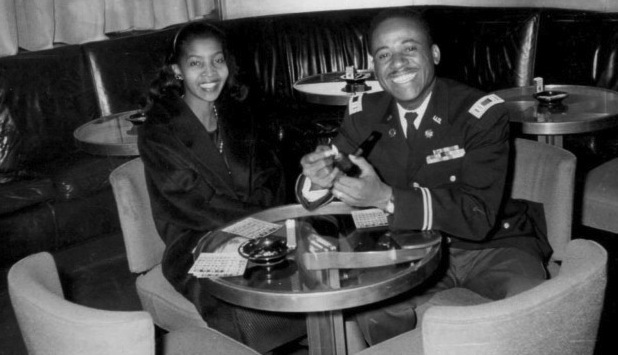 Happy couple sailing aboard the SS United States from New York to Germany. Many military personnel and their families sailed aboard the great ship. The legendary vessel was 100 feet longer and 10,000 tons heavier than the Titanic. 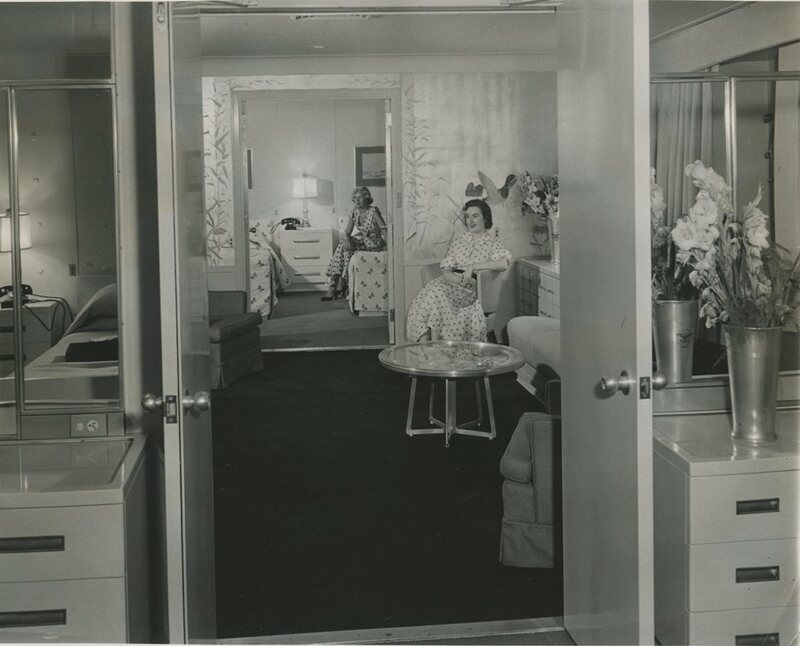 It was one of the fastest liners built and the epitome of the suave, modernist American style of the ’50s. But it has been out of commission since 1969 — killed by the advent of the jetliner. Stripped, bedraggled and moldering on the Delaware River for the past 18 years, the ship costs more than $60,000 a month just to keep docked. Now, Gibbs, whose Washington-based SS United States Conservancy owns the ship, is fighting what may be the final battle to preserve it — as a tribute to a bygone era and, for someone, a moneymaking enterprise. The dream is to fix it up so it can be moved to New York, its original home port, where developers could turn it into a museum, as well as exhibit, retail or living space. But it could cost a fortune — upward of $10 million to start and as much as $300 million, depending on how the ship is ultimately used. The conservancy has owned the ship since 2011, thanks to a donation of $3 million from a local philanthropist, H.F. “Gerry” Lenfest. Gibbs and her husband have contributed about $2,500 to the project. And Gibbs, as the conservancy’s full-time unpaid executive director, has devoted years to it. The conservancy raises money through donations from the public, private foundations and corporations, and in other ways. In June, as the group was about to sell off one of the ship’s propellers, cruise industry executive Jim Pollin, a conservancy member and the son of the late Washington sports team owner Abe Pollin, donated $120,000, with an offer to match $100,000 more. But that money will go fast. Although the conservancy is optimistic about its negotiations with potential developers, it has enough docking money only to last into the fall. If negotiations fall through and docking money runs out, it will have to sell the ship for scrap. “It’s now or never,” Gibbs says of the situation. A consultant for charitable foundations, Gibbs says she has taken on the task for posterity and as a way to mend her family saga. Her grandfather was a legendary but now largely forgotten naval architect whose name faded along with the era of the great transatlantic ocean liner. Although a bronze bust of him now sits before the fireplace in her home off Wisconsin Avenue, for many years she knew almost nothing about him. 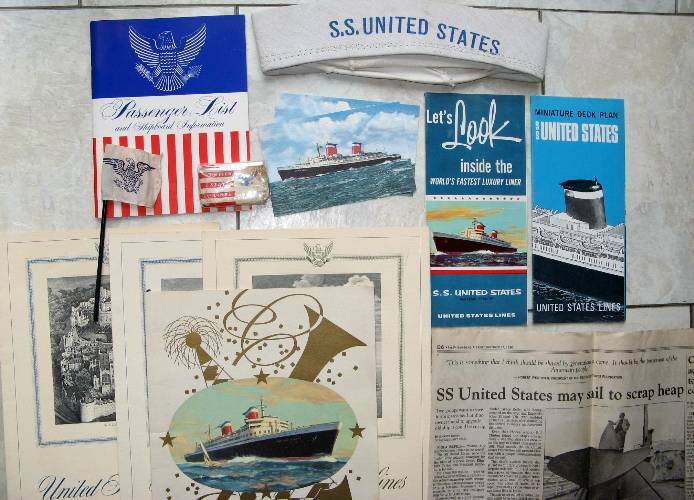 His design for the SS United States was his masterpiece. But she is also trying to save the ship for her late father, Frank, who died of brain cancer in 1995. He was the designer’s eldest biological son, and he became a small-town radio newscaster. But he lived his life in his demanding father’s shadow, Gibbs said, and rarely spoke of him when she was growing up. And she is doing it for herself. She said she has become entranced by the ship’s massive presence and has been moved by all the people who over the years have had connections to its story.